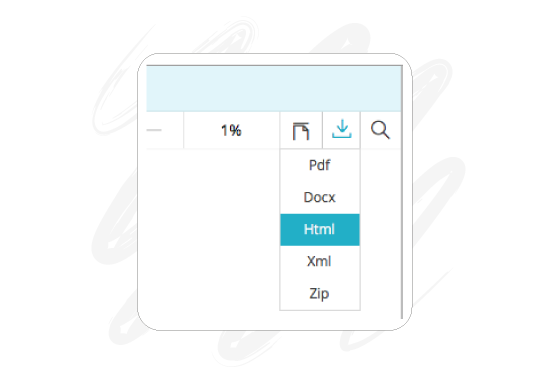 Choose from docx, pdf, html, xml or zip. The Reader in AuthorCafe gives you plenty of options to take your project out as docx, pdf, html or xml (TEI). You can package the images out as a zip. ePub support is arriving soon. From the Presenter in AuthorCafe, export your presentation as an html deck. The html you get from AuthorCafe is a single, flattened file, not a web archive. Being a single file, it travels as easily as a pdf and opens in any browser. The html file is lightweight and preserves all the links and interactions that you put into the project. Rich content finally get its due. Coming soon to AuthorCafe, you will be able to export your project to a wide variety of publisher templates. You get choices over font family, page size, number of columns, alignment and character styling for section headings, section numbering, section number labelling, and over reference styling. These features sit in the Reader in AuthorCafe and not in the Editor, because you don’t need to worry about publisher style until you’re ready to publish. Until then write to your own style and stay focused on the substance of your content.